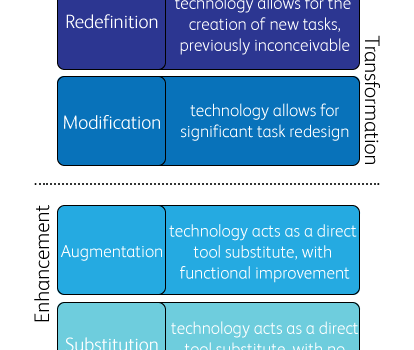 Redefining instruction using the SAMR model is easy in the digital classroom. 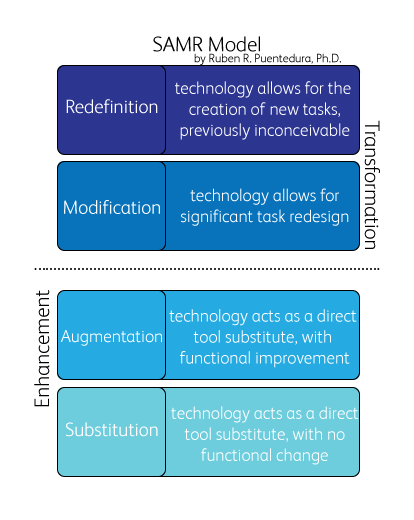 You are loaded with the tools you need to transform your instruction, not just enhance it. Here are my suggestions for moving your instruction above the line for a greater impact. Allowing students to record you and making your own instructional videos takes you out of your comfort zone. I know, I’ve been there. I began my 1 to 1 classroom four years ago with the first generation iPad, so there wasn’t a camera or all the great screencasting apps there are now. Lucky for me, I had an awesome co-worker who was willing to record my instruction before or after school with a flip camera. After take one, take two, take twenty-two, I discovered that it was okay to make mistakes and to be myself. Also, if I watched it, I would never post it! After watching kids snicker over something on an iPad screen, I discovered they had paused the video (with a not so beautiful expression on my face), taken a screenshot, put it in a doodle app, and added a few features. (Yep, my kids were AppSmashing before AppSmashing was cool). Nope, that wasn’t my ah ha moment! One day during the flashback, I moseyed over to bust a student with one earbud smoothly placed up his hoodie sleeve to his ear; I was certain he was on YouTube. He was. But, not on the video I was expecting. He was on MY instructional video from two weeks prior because he couldn’t do the flashback activity. That was it. That’s all it took for me to realize, it was worth it. That’s how you teach students to take responsibility for their own learning. You provide 24/7 access to content. Below are some ideas of how you can redefine your instruction. Start small. Play around with ScreenChomp. ScreenChomp easily provides a URL to your video. Make a QR code with the video. Start a tutoring binder with these QR codes titled with the content and date. Print the codes on address labels for the students to put in their binder or agenda. Using Today’s Meet, save the transcript as a PDF and upload to your Google Drive. Set it as public, make a QR code, and add it to the ScreenChomp page in the tutoring binder. Now, you have a page with a QR code linking to notes and a video. Once you’re comfortable creating videos, register a classroom hashtag for you and your students to use. Post the videos on Twitter. Allow your students to create videos too. Before a summative assessment, have each student create a ScreenChomp video reviewing something on the study guide. Open up a Today’s Meet for the assessment and have students paste the link to their ScreenChomp. Now, you have a study guide with instructional videos created by the students.